I think the Christmas collection from Lush is probably one of the biggest reasons I shop there, so when I saw this year’s offering, I definitely had to get my hands on some of their festive bath products. I didn’t get to try out the dashing santa bath bomb last year, so I decided I definitely needed to try this out this year. I purchased this bath bomb last year, so I was glad to see this one back again this year. I had reservations as I dislike marzipan but after using this I decided I definitely needed another this year. I believe this is a new one for 2015 and it’s gimmicky enough to immediately draw me in. I also like how there are five individual rings so that equals five luxurious baths over the Christmas period. When I saw this on the stand in Lush, I knew I had to pick one up. I’ve never tried a reusable bubble bar so this is a first for me but I love how it uses a cinnamon stick as a wand and is studded with cloves and star anise. It oozes Christmassiness so I cannot wait to use this over the festive period. This one is the odd one out of the bunch, being a Halloween themed bubble bar but I grabbed this one last year and really liked it so I purchased it again this year to indulge in this Halloween and it didn’t disappoint. 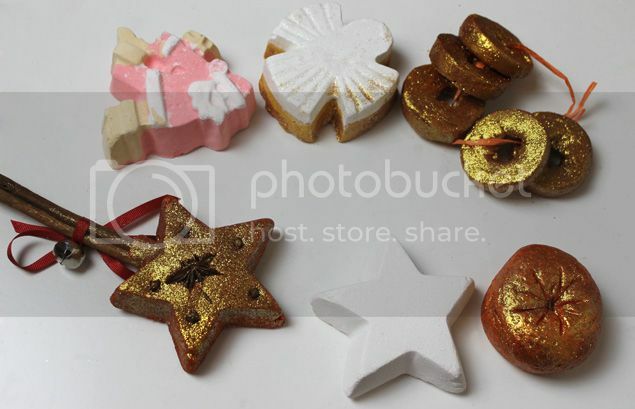 You can read my review of the Sparkly Pumpkin Bubble Bar here. Have you picked any Lush Christmas goodies up yet this year? Previous Post Entering the Christmas Party Season with Luxemme Next PostHappy 2016!! I haven’t bought any let, but I think I will.